At the table in Kiev where the formal agreement between the government, the opposition, the European Union and Russia was negotiated, there officially sat no representative of the powerful international oligarchy which – with closer ties to Washington and NATO than to Brussels and the EU – is pushing Ukraine towards the West. An emblematic case is Viktor Pinchuk, steel magnate, 54, ranked by Forbes Magazine among the richest men in the world. 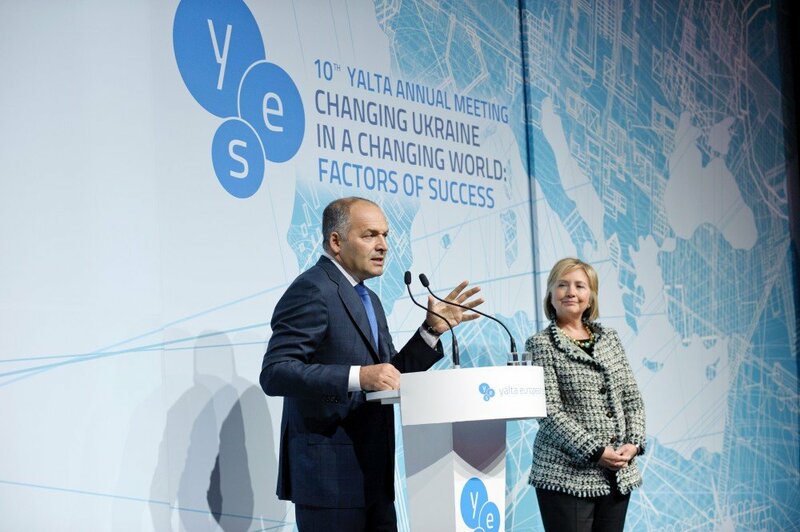 It is through this foundation that Pinchuk bonded with the Clintons, by supporting the Clinton Global Initiative established in 2005 by Bill and Hillary, whose mission is to “convene global leaders to create and implement innovative solutions to the world’s most pressing challenges.” Behind this shimmering slogan lies the real goal: to create a strong international support network for Hillary Clinton, the former first lady who, after serving as New York Senator in 2001-2009 and Secretary of State in 2009-2013, is undertaking her second climb to the presidency. Their fruitful collaboration began in 2007 when Bill Clinton thanked “Viktor and Elena Pinchuk for their vigorous social activity and the support provided to our international program.” That Pinchuk support translates into a first 5 million dollar contribution, followed by others, to the Clinton Global Initiative. This opened the doors to Pinchuk in Washington: for 40,000 dollars a month, he hired lobbyist Daniel E. Schoen, who organized a series of contacts with influential figures, including a dozen meetings in one year, between 2011 and 2012, with State Department officials. This proved to be excellent for business, allowing Pinchuk to increase his exports to the United States, although metallurgists in Pennsylvania and Ohio now accuse him of undercutting U.S. steel tube prices. 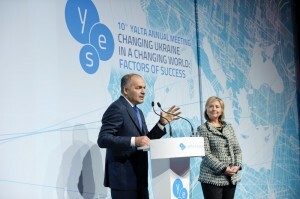 To further strengthen his ties with the United States and the West, Pinchuk launched the Yalta European Strategy (YES), “Eastern Europe’s largest social institution of public diplomacy,” whose official objective is to “help Ukraine develop into a modern, democratic and economically efficient country.” Thanks to Pinchuk’s financial capacity (he just splurged more than $ 5 million for his 50th birthday celebration in a posh French ski resort), the YES was in a position to set up a wide network of international contacts , which came to light at the annual meeting held in Yalta. It brought together “over 200 politicians, diplomats, statesmen, journalists, analysts and business leaders from more than 20 countries.” Among these, the names that most stand out are Hillary and Bill Clinton, Condoleezza Rice, Tony Blair, José Manuel Barroso and Mario Monti ( who attended the meeting last September), alongside other lesser-known characters, but not any less influential, including leaders of the International Monetary Fund. As Condoleezza Rice put it at the YES meeting in 2012, “Democratic transformations require time, require patience, require support. From outside as well as from inside.” An excellent summary of the strategy adopted by the West under the cloak of “outside support” to promote “democratic change.” A strategy amply consolidated from Yugoslavia to Libya, from Syria to Ukraine, which consists in driving a wedge between the cracks existing in any State and shake up its foundations by supporting or fomenting anti-government riots (like those in Kiev, too punctual and organized to be considered as merely spontaneous ), underpinned by a fever-pitch media campaign against the government marked for elimination. As regards Ukraine, the objective is to bring down the State or break it in two: one part that would join NATO and the EU; one that would remain largely connected to Russia. The Yalta European Strategy of the Clintons’ oligarch buddy fits into this context.